I went in not expecting much from this place. 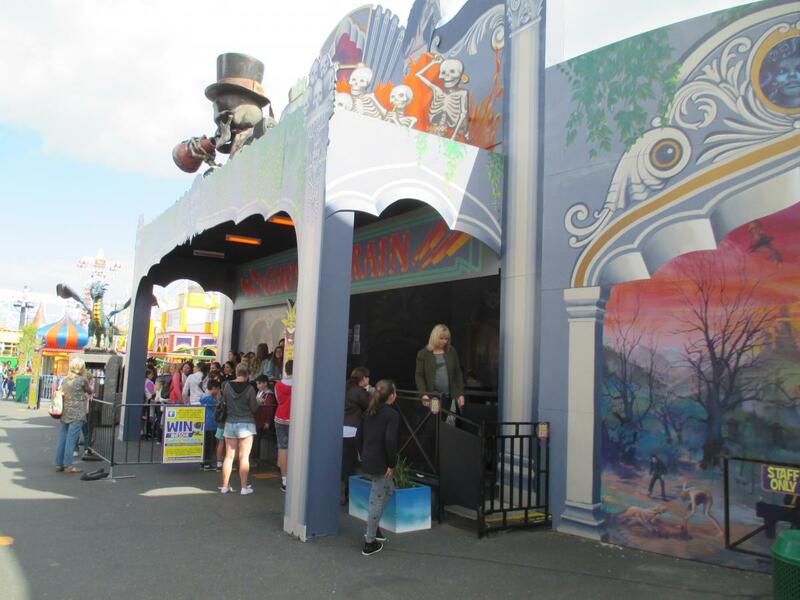 I went in to find horrible operations and rides closed ( power surge and ghost train) The park is smaller than the Luna Park in Sydney and not as charming. The price is too steep and should have been under $35. The ride attendants are very generic too. 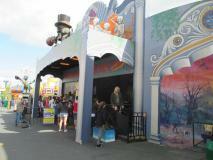 Some of the rides are decent though like the Twin Dragon and Enterprise. The Scenic Railway is very rough but somehow still liked it. Anyway on to the ride reviews. Scenic Railway- Very rough but still very fun. Only 1 train so I had to wait 20 minute+ every time. The problem is that they had two trains and they just switched them around once during the day. ( red to green) Also it has some nice airtime on the smaller hills and that was my favourite part of the ride. 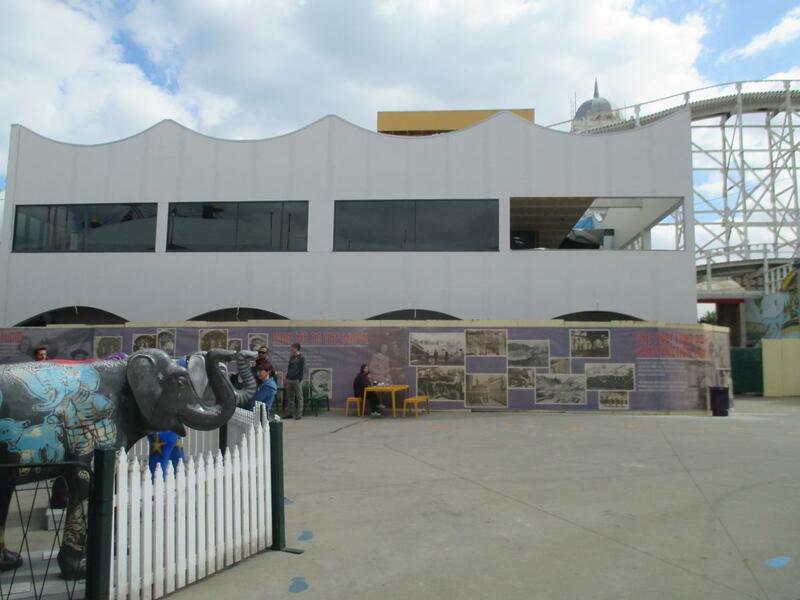 Pharoah's Curse- I was surprised that there was a bit of theming. As for the ride itself, it's painful. The restraints are so tight that when you are upside-down, you push down on the lap bar and pain is produced. 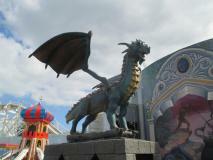 Twin Dragon- My favourite ride in the park as it was smooth and even a bit forceful. Nothing bad to say about the ride apart from being a bit loud when the ride is stopping. Spider- An ok family ride with signage!!!!! The main problem about the Spider is that you barely spin at all and it becomes a bit boring. I like the way they open the carriages though. Enterprise- Another ride with bad operations. The ride is very fun though and pleasant. There isn't much force though but it's mostly smooth. Sky Rider- A ferris wheel that never stops. There are some nice views of the beaches in St Kilda though. 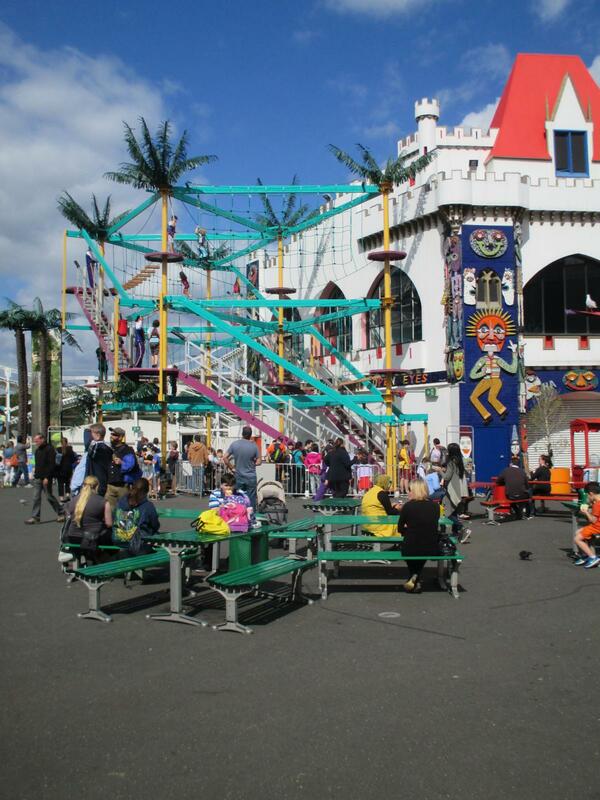 Overall I would give Luna Park Melbourne a 4/10. It's just missing so much and awful operations set it back. They need to really improve and they should start with the operations. Photos coming in a few days. I visited LPM yesterday as well. It's amazing how popular this place is and yet management doesn't seem to want to speed things up a bit. Needless to say, I didn't go on any of the rides. They receive 800,000 a year which is mindblowing but the only reason I can think of is because it's the only park Melburne has. AUSSIETHEMEPARKS: please stop quoting entire posts for no reason. Must have been unlucky with the spider as when I was there on Sunday had no issues with it spinning. Will be honest and say I enjoyed it more than Scenic Railway. I must have been sitting in the wrong part of the train for Scenic Railway as I didn't really experience much airtime from it from the final three hills and experiencing the rest of it twice was more than enough for me. I didn't find the operations that bad and will say the friendliness of the staff was great. The one real positive for the park. 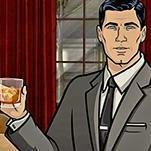 So much for FOX promising to make this place awesome again. One thing I can't understand is I am not allowed to ride the powersurge there as the max height is 190cm and I am 193. The thing is I have ridden them all around and i have never seen one with a height requirement under 200cm before, anywhere in the world. In fact trying to google such a thing just brings up the luna park page as it really seems to be the world's only power surge with a maximum height of 190. Does anyone know why, even the faintest clue? To have a decent flat so close to home and not be able to ride it is indeed frustrating. correct.. the adventure world one has no upper height limit nor does any other i can find.. luna park is truly exclusive in this matter and I am stumped and they don't have an answer for me as to "why". I have ridden the show ones, a couple OS too, no issue. So.. I guess i need to get myself to perth to ride abyss anyway, so i can enjoy the PS there instead. No other option lol. ^ Yeah, I thought Adventure World's one used to have an upper weight limit - I will have to investigate. At Luna Park I noticed that the Ghost Train has a nice little animated dragon. They have a climbing playground that is proving very popular. 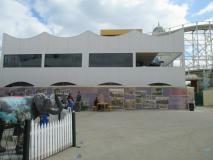 The construction of the two storey building is almost complete. Oh cool re the dragon! nice find. I wish they could put a new coaster in.. I mean the guy that owns it is so wealthy he really CAN afford it, and these days there are truly compact solutions he could go for. Perhaps he needs to talk to people like us for suggestions! BTW AW might have weight limit but I am 88 KG.. so basically I am slim to average for my height. Only thing I have ever been rejected riding before this was deja vu at SFMM, and I am right on the "ok" threshold for intamin bizarro, etc. Deja vu was a 6'3 limit and I am 6'4. But work this out... the EU version (stunt fall) and the silverwood version (bought from six flags) are both 200cm.. yet the one at SFNE is still 190. It's all so weird. It doesn't make any sense.... and they let me ride dejavu after a slight body bend when i took my shoes off and was barefoot and I am still alive to tell the tale. I wasn't even *close* to any issues with restraints or legs hitting something. Anyway, if anyone does ever find out re the PS let me know. FWIW I am going to email zamperla and ask them why that one installation has the limit and no other PS in the world does. I don't expect they will answer but maybe they will and surprise me. Back to LPM... how bumpy is the scenic railway these days? OP was saying it was rough but airtime.. even when a kid and light i can't ever remember getting airtime on that in front or back seat. Are they still using the brakeman or have they adopted new trains? Is it a total back breaker or just "unpleasant" sort of thing? Best way to describe it would be aggressively bounces your body between the seat and the lap bar. First and second drops (and surprisingly following up hill section) I found to be the worst. Still running same trains with brake person. Have to agree on the no airtime thing. The climbing course is a school holidays only thing according to the park map. Was also surprised to find they had organised the "Great Luna Park Easter Egg Hunt" on Easter Sunday and even had a Easter Bunny character out roaming the park at times through the day. I didn't get to go on Power Surge as it was closed on the day I visited. It seems like power surge is always closed but no one ever tries to fix it. When I was there, after about an hour the line was huge for tickets, like back out of the mouth entry. Though it looked like a large muslim group were a lot of the line. It must be the lack of similar attractions, as has been observed in the thread, that gets such a high level of attendance for a small park. Oh well, it does make Luna Park Sydney look like Cedar Point by comparison. I wouldn't go back there unless they added a major new attraction, in other words, never. I must say the "Line jumpers will be torn in half and eaten by demons" signs at the scenic railway were an amusing touch. Thanks. Yes i rememeber the bouncing as you describe it, and therefore haven't ridden it since around 15 years back. powersurge is listed on website as currently closed. ^^I wonder if being jolted out of your seat could be counted as airtime. ^The Ghost Train was just OK, not a whole lot going on in there, definitely been on better. I have no idea but I don't think it's intentional. ^My tongue is firmly in cheek there. I've been on a few Scenic Railway type coasters, you can definitely get some good airtime on some of them like the one at Tivoli when the brakeman is doing you a favour (they have a hall of shame (aka wall of horror) in the maintenance area at Tivoli for brakeman who've de-railed a train). Best way to describe it would be aggressively bounces your body between the seat and the lap bar. First and second drops (and surprisingly following up hill section) I found to be the worst. You don't say! 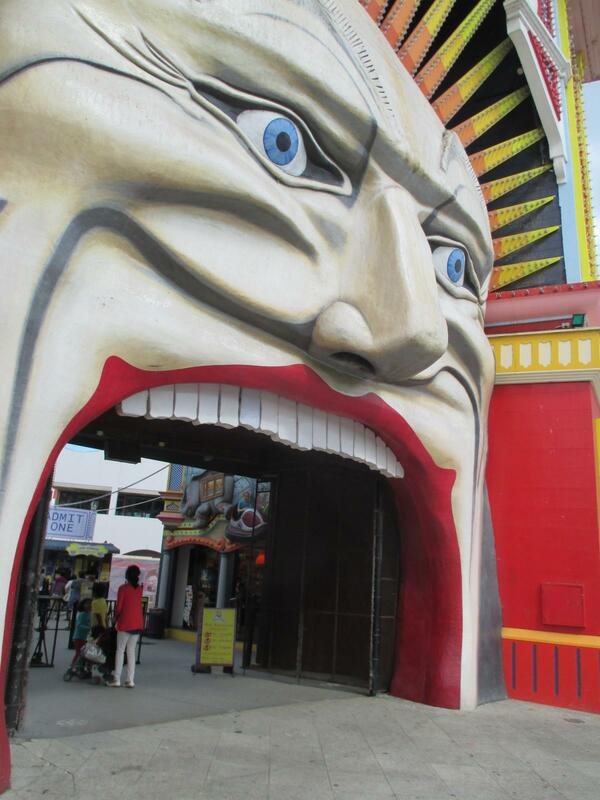 I visited Luna Park during my first ever trip to Melbourne last year. My best friend (a local) and I rode the Scenic Railway, a first for both of us. Anyway, he is well over 6" tall and didn't fit into the carriage very well because of his long legs. I'm surprised they didn't have any height restrictions in place, at least any that would indicate that people of his height are bound to get injured, given the lack of leg room provided.